Fir perfect. What a deall! First, let me correct this for future shoppers: These do NOT fit 1972-1975 CJ-5 vehicles. These are the "transition years" vehicles, and while they look the same from the outside, the inner fenders are not the same. 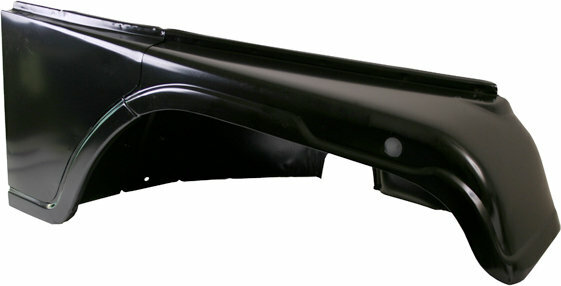 If you want to use these on a 1972-1975 CJ-5, you will have to modify the inner fender. That said, the body lines are not well stamped, and I had to finish shaping one of the fenders myself. I am experienced in body repair and these are middle of the road replacement panels. The metal is about 2/3 the thickness of the original. The coating is good, and stands up well in the shop. I have had them in the shop for around a year now, and neither fender nor the hood I also ordered have developed any surface rust. I ordered these, then afterwards I bought a used set of original fenders and I will likely use those as repairing the rust and preparing them for refinishing will be less time and effort than modifying these to fit the Jeep. Crown is a decent brand, and their parts are usually good. I will be using the hood.